2011-08-30 Assigned to ACUSHNET COMPANY reassignment ACUSHNET COMPANY ASSIGNMENT OF ASSIGNORS INTEREST (SEE DOCUMENT FOR DETAILS). Assignors: COMEAU, BRIAN, SULLIVAN, MICHAEL J. A golf ball including a highly-neutralized thermoplastic inner core layer having a geometric center hardness less than a surface hardness to define a first hardness gradient, an outer core layer formed from a homogenous thermoset composition and having an interior hardness substantially less than an outer surface hardness to define a second hardness gradient, an inner cover layer, and an outer cover layer. Both the first and second hardness gradients are positive and a slope of the second hardness gradient is greater than a slope of the first hardness gradient to define a shallow hardness gradient inner core and a steep hardness gradient outer core layer. This application is a continuation-in-part of co-pending U.S. patent application Ser. No. 13/041,286, filed Mar. 4, 2011, which is a continuation of co-pending U.S. patent application Ser. No. 12/891,324, filed Sep. 27, 2010, which is a continuation-in-part of U.S. patent application Ser. No. 12/339,495, filed Dec. 19, 2008 and now U.S. Pat. No. 7,815,526, which is a continuation-in-part of U.S. patent application Ser. No. 12/196,522, filed Aug. 22, 2008 and now U.S. Pat. No. 7,582,025, which is a continuation of U.S. Pat. No. 7,427,242, filed Nov. 14, 2007, the disclosures of which are incorporated herein by reference thereto. FIG. 4 depicts representative hardness measurements (in Shore C and D) and hardness gradient for a dual core having an inner core with a diameter of 1.13 inches and an outer core layer with a thickness of 0.225 inches. In a preferred embodiment, the golf balls of the present invention include an inner core layer formed from a thermoplastic (TP) material to define a “positive hardness gradient” and an outer core layer formed from a thermoset (TS) material to define a steep “positive hardness gradient.” The TP hardness gradient may be created by exposing the inner core layers to 1) a high-energy radiation treatment, such as electron beam or gamma radiation, such as disclosed in U.S. Pat. No. 5,891,973, which is incorporated by reference thereto, 2) lower energy radiation, such as UV or IR radiation; 3) a solution treatment, such as an isocyanate or a silane; 4) incorporation of additional free radical initiator groups in the TP prior to molding; and/or 5) chemical modification, such as esterification or saponification, to name a few. The magnitude of the “positive hardness gradient” of the inner core layer is preferably “shallow” relative to the “steep” “positive hardness gradient” of the outer core layer, the terms “shallow” and “steep” being defined by the slopes of their comparative plots of hardness as a function of position away from the center of the core when the hardness is measured across the cross-section of a core. For example, magnitude of hardness change across either core layer may be similar or different, but in the case of similar hardness gradients, the gradient for the inner core may still be deemed “shallow” because the gradient is measured across a longer dimension than that of the outer core layer (i.e., a gradient of 10 Shore C across a 15-mm-radius inner core has a much more gradual slope than a 10 Shore C gradient across a 5-mm-thick outer core layer). In a more preferred embodiment, the hardness gradient of the outer core layer is greater than or equal to the hardness gradient of the inner core layer, most preferably the hardness gradient of the outer core layer is greater than the hardness gradient of the inner core layer. Other suitable silanes include, but are not limited to, silane esters, such as octyltriethoxysilane, methyltriethoxysilane, methyltrimethoxysilane, and proprietary nonionic silane dispersing agent; vinyl silanes, such as proprietary, vinyltriethoxysilane, vinyltrimethoxysilane, vinyl-tris-(2-methoxyethoxy)silane, vinylmethyldimethoxysilane; methacryloxy silanes, such as γ-methacryloxypropyltrimethoxysilane; epoxy silanes, such as β-(3,4-epoxycyclohexyl)ethyltrimethoxysilane, γ-glycidoxypropyltrimethoxysilane; sulfur silanes, such as gamma-mercaptopropyltrimethoxysilane proprietary polysulfidesilane, bis-(3-[triethoxisily]-propyl)-tetrasulfane; amino silanes, such as γ-aminopropyltriethoxysilane, γ-aminopropyltriethoxysilane, γ-aminopropyltriethoxysilane, aminoalkyl silicone solution, modified aminoorganosilane, gamma-aminopropyltrimethoxysilane, n-β-(aminoethyl)-γ-aminopropyltrimethoxysilane, modified aminoorganosilane (40% in methanol), modified aminosilane (50% in methanol), triaminofunctional silane, bis-(γ-trimethoxysilylpropyl)amine, n-phenyl-γ-aminopropyltrimethoxysilane, organomodified polydimethylsiloxane, polyazamide silane (50% in methanol), n-β-(aminoethyl)-γ-aminopropylmethyldimethoxysilane; ureido silanes, such as gamma-ureidopropyltrialkoxysilane (50% in methanol), γ-ureidopropyltrimethoxysilane; isocyanate silanes, such as γ-isocyanatopropyltriethoxysilane; and mixtures thereof. 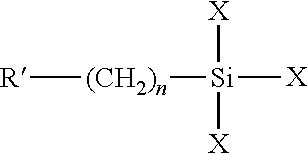 Preferably, the silane is an amino silane and more preferably, the amino silane is bis-(γ-trimethoxysilylpropyl)amine. Examples of desirable polybutadiene rubbers include BUNA® CB1203, CB1220, CB1221, CB22 and CB23, commercially available from LANXESS Corporation; UBEPOL® 360L and UBEPOL® 150L and UBEPOL-BR rubbers, commercially available from UBE Industries, Ltd. of Tokyo, Japan; Europrene® NEOCIS® BR 40 and BR 60, commercially available from Polimeri Europa; and BR 01, BR 730, BR 735, BR 11, and BR 51, commercially available from Japan Synthetic Rubber Co., Ltd; BUNA® CB Nd40 from Lanxess; and KARBOCHEM® ND40, ND45, and ND60, commercially available from Karbochem. where R1-R5 can be C1-C8 alkyl groups; halogen groups; thiol groups (—SH), carboxylated groups; sulfonated groups; and hydrogen; in any order; and also pentafluorothiophenol; 2-fluorothiophenol; 3-fluorothiophenol; 4-fluorothiophenol; 2,3-fluorothiophenol; 2,4-fluorothiophenol; 3,4-fluorothiophenol; 3,5-fluorothiophenol 2,3,4-fluorothiophenol; 3,4,5-fluorothiophenol; 2,3,4,5-tetrafluorothiophenol; 2,3,5,6-tetrafluorothiophenol; 4-chlorotetrafluorothiophenol; pentachlorothiophenol; 2-chlorothiophenol; 3-chlorothiophenol; 4-chlorothiophenol; 2,3-chlorothiophenol; 2,4-chlorothiophenol; 3,4-chlorothiophenol; 3,5-chlorothiophenol; 2,3,4-chlorothiophenol; 3,4,5-chlorothiophenol; 2,3,4,5-tetrachlorothiophenol; 2,3,5,6-tetrachlorothiophenol; pentabromothiophenol; 2-bromothiophenol; 3-bromothiophenol; 4-bromothiophenol; 2,3-bromothiophenol; 2,4-bromothiophenol; 3,4-bromothiophenol; 3,5-bromothiophenol; 2,3,4-bromothiophenol; 3,4,5-bromothiophenol; 2,3,4,5-tetrabromothiophenol; 2,3,5,6-tetrabromothiophenol; pentaiodothiophenol; 2-iodothiophenol; 3-iodothiophenol; 4-iodothiophenol; 2,3-iodothiophenol; 2,4-iodothiophenol; 3,4-iodothiophenol; 3,5-iodothiophenol; 2,3,4-iodothiophenol; 3,4,5-iodothiophenol; 2,3,4,5-tetraiodothiophenol; 2,3,5,6-tetraiodothiophenol and; and their zinc salts. Preferably, the halogenated thiophenol compound is pentachlorothiophenol, which is commercially available in neat form or under the tradename STRUKTOL®, a clay-based carrier containing the sulfur compound pentachlorothiophenol loaded at 45 percent (correlating to 2.4 parts PCTP). STRUKTOL® is commercially available from Struktol Company of America of Stow, Ohio. PCTP is commercially available in neat form from eChinachem of San Francisco, Calif. and in the salt form, also from eChinachem. Most preferably, the halogenated thiophenol compound is the zinc salt of pentachlorothiophenol, which is commercially available from eChinachem. As described above, the preferred embodiment is a golf ball having a dual core. The dual core includes an inner core formed from a thermoplastic material and the outer core layer is formed from a thermoset material. The inner core material exhibits a ‘shallow’ “positive hardness gradient” across its radius. The outer core layer material exhibits a ‘steep’ “positive hardness gradient across its thickness, the slope of the gradient being greater than that of the gradient of the inner core. Hardness measurements are made as described herein. The hardness measurements for the gradient of the inner core are taken across the radius of a cross-section of the inner core. The hardness measurements for the gradient of the outer core layer are taken across the thickness of a cross-section of the outer core layer. wherein the first and second hardness gradients are positive and a slope of the second hardness gradient is greater than a slope of the first hardness gradient. 2. The golf ball of claim 1, wherein a ratio of the slope of the second hardness gradient to the slope of the first hardness gradient is greater than 1. 3. The golf ball of claim 2, wherein a ratio of the slope of the second hardness gradient to the slope of the first hardness gradient is greater than 1.5. 4. The golf ball of claim 3, wherein a ratio of the slope of the second hardness gradient to the slope of the first hardness gradient is greater than 2. 5. The golf ball of claim 1, wherein the inner core layer has an outer diameter of about 0.5 inches to about 1.13 inches. 6. The golf ball of claim 1, wherein the first hardness gradient is less than 10 Shore C and the second hardness gradient is greater than 10 Shore C.
7. The golf ball of claim 6, wherein the first hardness gradient is less than 5 Shore C and the second hardness gradient is greater than 15 Shore C.
8. The golf ball of claim 1, wherein the acid groups of the copolymer are neutralized by 90% or greater. 9. The golf ball of claim 8 wherein the acid groups of the copolymer are neutralized by about 100%. 10. The golf ball of claim 1, wherein the organic acid or salt thereof comprises barium, lithium, sodium, zinc, bismuth, chromium, cobalt, copper, potassium, strontium, titanium, tungsten, magnesium, cesium, iron, nickel, silver, aluminum, tin, or calcium salts, or salts of fatty acids. 11. The golf ball of claim 10, wherein the fatty acid salt comprises stearic acid, behenic acid, erucic acid, oleic acid, linoelic acid or dimerized derivatives thereof. 12. The golf ball of claim 10, wherein the organic acid or salt thereof comprises a magnesium salt of oleic acid. 14. 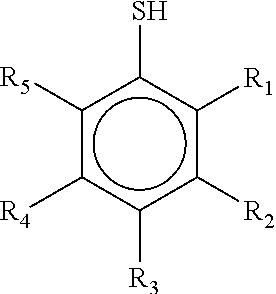 The golf ball of claim 13, wherein the soft and fast agent comprises a halogenated thiophenol. 16. The golf ball of claim 15, wherein a ratio of the second positive hardness gradient is greater than the first positive hardness gradient. 17. The golf ball of claim 16, wherein the ratio is greater than 1.5. 18. The golf ball of claim 17, wherein the ratio is greater than 2.